Following up his surprise Oscar winner Moonlight, Barry Jenkins adapts James Baldwin’s novel of 1970s Harlem in this sumptuous tale of lovers divided by circumstance. 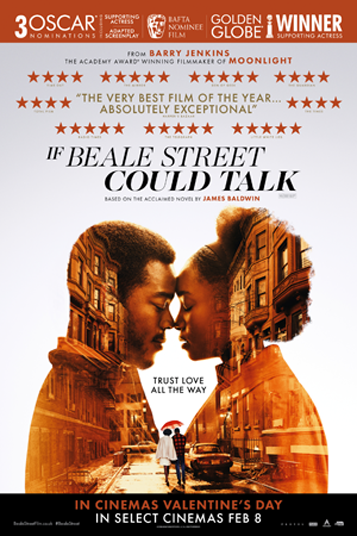 Deeply in love, Tish (KiKi Layne) and Fonny (Stephan James) find their hopes for a life for themselves are dashed when Fonny is wrongly imprisoned. Their fight for justice pushes them and their family and their love to the limits and offers a panorama of America during a time of deep change. Once again taking social realist material and blending it with a poetic eye, Beale Street glows off the screen. Yet the undeniable beauty of the film softens none of the films acute messages about life as an African-American in a country rife with prejudice.